The B2B industry is full of businesses trying to make their mark and increase sales by keeping a check on resources, time, clients and prospects. While prioritizing marketing and sales, often professionals forget that the first step of any good campaign is clean, up-to-date data. 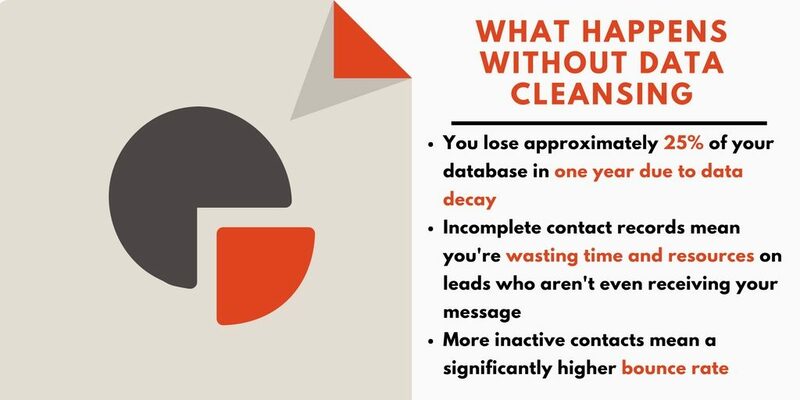 Filling your database or CRM full of prospects/clients is important, but not as important as ensuring that existent data is regularly cleansed and enriched. While there is no set timeline for cleaning your data, data hygiene best practices dictate that you should check your database at least once in 3 months. Some businesses also opt to check and cleanse their list on a monthly basis to ensure that they are reaching their full list of subscribers and prospects. Here are a few downsides of not ensuring that your data is clean and up-to-date. Having said this, cleaning your entire database can be a massive project. While many opt for the various (paid and unpaid) data cleansing tools available, it can still take up precious time and resources – time and resources that many businesses simply don’t have. The second most important consideration is the lack of expertise connected to data hygiene best practices. Yes, your guys in sales and marketing are uniquely talented in their respective areas. However, this does not mean that they have the necessary expertise to properly cleanse and enrich data. It’s just more feasible to leave data hygiene to experts whose ‘only’ job incorporates the task of ensuring that your data is accurate, verified and up-to-date. Expertise aside, consider the high chance of human errors – typos, duplication and other such inaccuracies are only natural. Another aspect of data hygiene best practices is enrichment of your database. Simply defined, data enrichment refers to adding value to your current database. This can be done in the form of adding new verticals to your B2B contact data such as social profiles, buyer propensity, software used etc. This can be a task and a half – requiring complicated and time consuming research, a mix of software and human verification in addition to special expertise which in-house teams might lack. So what’s the best solution for ensuring that your database is up-to-date, accurate and enriched? Outsourcing your data cleaning needs as a part of data hygiene best practices! Here are a few reasons you must entertain the idea of ‘outsourcing’ your data hygiene requirements. Businesses don’t need to exhaust their time, resources or money on data cleansing and data enrichment. 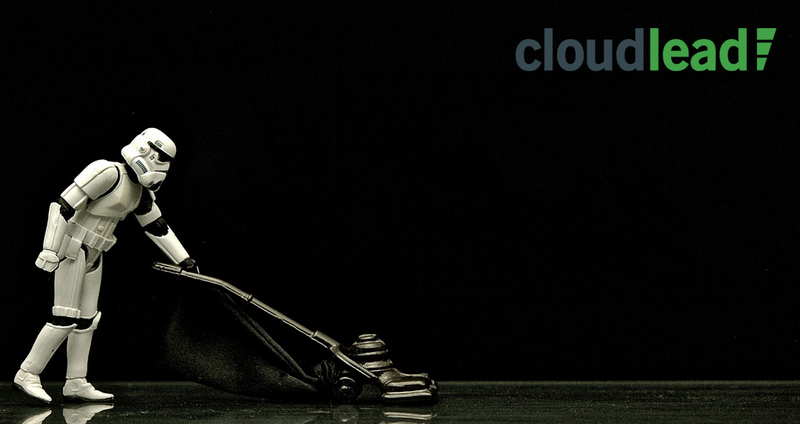 Simply outsourcing your data hygiene needs to an expert such as Cloudlead can save you considerable time and resources. Outsourcing is cost effective and saves you the trouble of hiring and training an in-house data team. It also practically eradicates any chance of errors creeping up in your database. For example, at Cloudlead, we have a comprehensive process for data cleansing. 1 – Data is run through our own data validation software to correct formatting for a number of verticals (e.g. name, phone, email etc.) and verifying information such as emails. 2 – Data is then manually checked/verified by our team of trained researchers and analysts. 3 – The Quality Control team then runs the data through our validation tool again and conducts random checks to ensure that the data is accurate. No time wasted: Efficiency at its peak! Data management systems are no joke…they require niche expertise, time and energy. Imagine this: Spending all working hours confirming contacts and refining data. This requires a dedicated team of people working full-time, flushing out redundant data and improving existing contact information. Of course, it’s much more convenient to outsource data cleansing and data enhancement, plus this also guarantees that your main business is not affected and runs smoothly. You do what you do best, and trust a data provider to do what they do best. Data companies mine, enrich and cleanse tones of email lists every day for companies and so are more experienced than you. That’s the truth! They know what they’re doing and how it needs to be done. They’re also well aware of how to refine data. You on the other hand, would probably need to train or hire these same experts at a ‘higher salary’, to handle an in-house data management system. Companies such as Cloudlead deal with a variety of clients across diverse industries. This extensive experience provides us the relevant expertise in list building and database enrichment. Each member of our team holds unique research skills and data collection strategies up their sleeves, and are well-versed in data hygiene best practices. These are qualities you could benefit from if you choose to outsource. Instead of running through a route of overlapping complications and unsatisfactory results, the best decision would be to assign data cleansing and data refining to an expert. One of the most important factors that makes outsourcing more practical is that data providers have access to much more than you do. Whether its data cleansing tools or research strategies, providers such as Cloudlead have more means to achieve better results. In addition to tools for detecting invalid email addresses, our researchers are especially trained to track down information which could allow you to target your leads better. Don’t forget that every company is an expert at whatever it does. Similarly, B2B data companies provide services that save time and money for other businesses. At Cloudlead, our goal is to grow and prosper as a company, whilst fulfilling the data requirements of other businesses. Other than being experts in data hygiene best practices, our team and tools combine to ensure that our data has some of the lowest bounce rates, and that we can track down hard to find information for our clients.